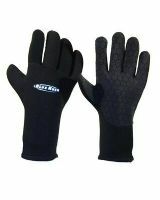 Our Blue Rush wetsuit gloves are manufactured to a high standard. They are made from 2.5mm neoprene and are double lined with blind stitching. The palm is lined with latex for additional grip.